The length of productive life is of major economic importance in dairy cattle production. Simple breeding objectives such as selection for increased production in dairy cattle have led to a significant decline in fitness traits. The objective of the current study was to investigate whether direct selection for production resulted in an undesirable genetic response in longevity in the South African Jersey breed. Longevity was defined as survival in the first three lactations from first calving to culling or death, adjusted for the effect of milk yield. An observation for survival per lactation was denoted by 1 (survived) or 0 (culled) otherwise. Performance and pedigree records on purebred South African Jersey cows that participated in the National Milk Recording and Improvement Scheme were considered. A multiple-trait linear animal model was used to estimate breeding values. A complete (co)variance structure for the additive genetic and residual effects for the three traits were used. Heritabilities used in the current study were 0.034, 0.022 and 0.026 for the 1st, 2nd and 3rd lactations, respectively. Reliabilities were approximated using the effective number of daughters. The estimated breeding values for sires ranged from 79 to 114. The rate of genetic progress per year for the period 1985 to 2002 was statistically non-significant (b = 0.02 ± 0.05 per year). Results from the current study indicate that direct selection for production did not result in an undesirable correlated genetic response in longevity. Longevity or herd life is of major economic importance in dairy cattle production (Boettcher et al., 1999a; Settar & Weller, 1999). Longevity can be measured in a variety of ways, and genetic evaluations are not standardized across countries. 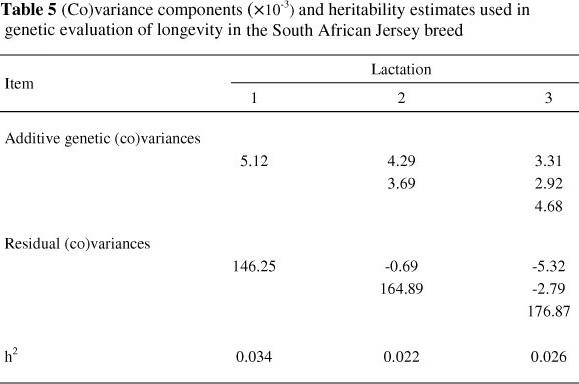 However, its heritability is low, and herd life is expressed at a later age than traits used in the current South African Jersey selection programme. Increased longevity affects overall profitability of milk production by reducing replacement costs and increasing the proportion of mature, high-producing cows in the herd. It also enables a greater selection response, because fewer cows have to be replaced, and therefore higher selection intensity of cows is possible (Vukasinovic et al., 2001). Selection for herd life is hampered by the time required for cows to have complete records. For maximum genetic progress, genetic merit of cows must be evaluated based on information that is available early in life. It therefore follows that genetic evaluation for herd life must be able to utilize incomplete herd life information on cows that are still in the herd when selection decisions are made (Jairath et al., 1998). As a result, most national genetic evaluation programmes for dairy cattle include breeding values for longevity (Miglior et al., 2005; Forabosco et al., 2008). Different definitions for longevity have been considered in dairy cattle in several countries, leading to different models being implemented in national genetic evaluation for longevity (Sölkner & Ducrocq, 1999; Veerkamp et al., 2001; Caraviello et al., 2004). These definitions are based on the number of parities or the actual length of herd life (Vollema & Groen, 1996). Furthermore, genetic differences for milk yield will have a major effect on direct measures of survival, because low milk yield is a major cause of cow culling (Settar & Weller, 1999). Many studies have proposed analysing functional herd life, which is generally computed as longevity adjusted for milk yield (Jairath et al., 1998; Settar & Weller, 1999). This trait is independent of production, and reflects the fertility, health and overall fitness of the cow. In the present study functional herd life was defined as survival in the first three lactations with survival in each lactation considered as genetically correlated traits. Du Toit et al. (2009) found genetic correlations ranging from 0.68 to 0.99 between survival adjusted for production within each of the first three lactations. Jairath & Dekkers (1995) reported genetic correlations among survival in the first three lactations. These values were only moderately high (0.60 to 0.75), indicating that survival was a different genetic trait in each lactation. Boettcher et al. (1999) reported estimates that were higher (0.84 to 0.91). To accommodate these differences, the Canadian genetic evaluations models survival as different traits in the first three lactations, assigning cows to different contemporary groups for each subsequent calving. The objective of the current study was to investigate whether direct selection for production resulted in an undesirable genetic response in functional longevity in the South African Jersey breed. Performance and pedigree records of South African purebred Jersey cows that participated in the National Milk Recording and Improvement Scheme were obtained from the South African national livestock database, commonly known as the Integrated Registration and Genetic Information System (INTERGIS). The original data (before editing) included production records from 245 134 Jersey cows from 2004 herds. These cows were progeny of 5 364 sires and 124 868 cows and were born between 1968 and 2005. Observations for functional herd life were derived as follows: survival in a given lactation was determined based on the presence or absence of a subsequent lactation. Survival was treated as a binary trait and coded 1 if the cow survived and 0 if the cow was culled or if the number of days between the current calving date and extraction date exceeded 581. Records from cows in which the number of days between the current calving date and data extraction date were fewer than 581 were considered records in progress and were excluded from the analysis. The value 581 was calculated as mean calving interval plus 3 standard deviations (mean ± SD values) to ensure each cow had enough opportunity to calve if it was still in the herd (Du Toit et al., 2009). The criteria used to determine survival are explained in Table 1. The editing criteria employed in the official national evaluation for production traits for the Jersey breed were used. Specifically, the following records were excluded from the analysis: 1) test-day milk yield <1 kg or >70 kg, fat percentage <2% or >9%, and protein percentage <2% or >6%; 2) the interval between calving and first test day exceeding 75 days; 3) at least one interval between test dates exceeding 100 days; and 4) records with more than one test date interval between 60 and 100 days. 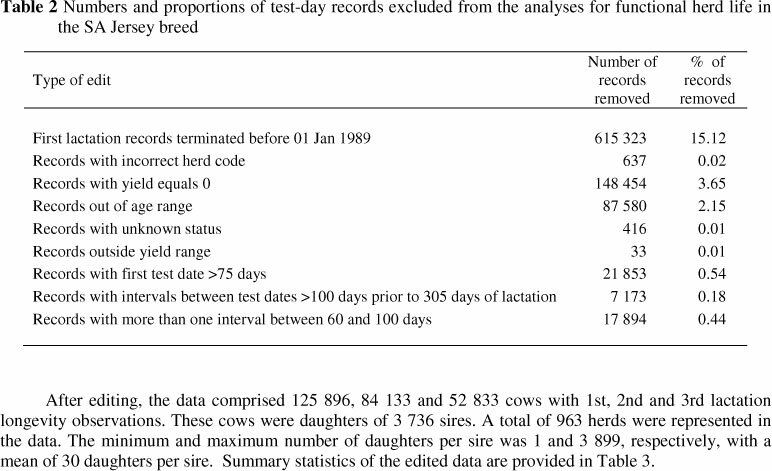 Furthermore, 1) first lactation records terminated before 01 January 1989 were excluded because there were only a few cows with test-day records prior to 1989; 2) records with incorrect herd code and records outside specified age range were excluded; the allowable age ranges were as follows: 17 to 40, 29 to 53, and 41 to 67 months for first, second, and third parity, respectively; and 3) records with unknown registration status were excluded. A summary of the records excluded because of specific criteria is provided in Table 2. Most of the records were deleted mainly owing to first lactations being terminated before 01 January 1989 (15.1%), followed by records with yield equals 0 (3.6%) and records out of age range for the first three parities (2.2%). After editing, the data comprised 125 896, 84 133 and 52 833 cows with 1st, 2nd and 3rd lactation longevity observations. These cows were daughters of 3 736 sires. A total of 963 herds were represented in the data. The minimum and maximum number of daughters per sire was 1 and 3 899, respectively, with a mean of 30 daughters per sire. Summary statistics of the edited data are provided in Table 3.
where y is a vector of observations, β is a vector of fixed effects, a is a vector of random additive genetic effects, g is a vector of genetic group effects, and e is a vector of random residuals. X and Z are incidence matrices relating fixed and random effects respectively to observations; Q is an incidence matrix that relates animals to genetic groups. The following distributional assumptions were made about the random effects: . The σ2a and o2e are the animal additive genetic and residual variances, respectively. The A is the Wright's numerator relationship matrix and R is a residual matrix. 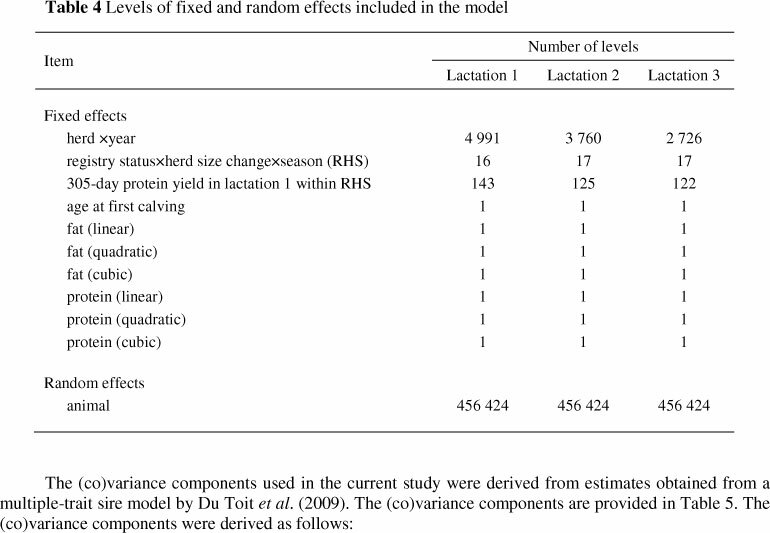 The fixed effects considered in the model were herd x year; registry status x herd size change x season (RHS); age at first calving (linear and quadratic regression); linear regression on normalized deviation of 305-day protein yield in lactation 1 within RHS; linear, quadratic and cubic regressions on normalized deviation of 305-day protein and fat yields. Fixed effects were defined as follows: Registration status was defined in two classes: cows in herds with registered cows; and cows in herds with non-registered cows. Three classes for change in herd size were defined based on the percentage of change from one year to the next (decreasing = for a decrease in herd size of <-5%; nearly unchanged = no appreciable change ≥-5% to ≤10%; and increasing = for increasing in herd size of >10%). Similar to Mostert et al. (2004), two seasons of calving were defined as Winter (season 1, from April to September) versus Summer (season 2, from October to March).The first lactation protein and fat yields were used because the genetic correlation between first lactation yield and yield in later lactations is high. Furthermore, low yield in the terminal lactation could have been caused by a health problem, which is what functional herd life attempts to measure (Short & Lawlor, 1992). A pedigree file used in the current study to account for relationships among animals included all cows with observations and their ancestors (n = 456 355) and genetic groups (n = 69). A genetic group was defined as a concatenation of country of origin, year of birth, and selection path (e.g. sire of sire, sire of dam, dam of sire and dam of dam). Table 4 shows the levels of the fixed and random effects considered in the current study. (4) Residual (co)variance between two lactations using for , where Ei is the residual from a sire model. Estimated breeding values (EBVs) were obtained using PEST (Groeneveld et al., 1994). Estimates of breeding values for lactations 1, 2 and 3 were obtained from solving the mixed model equations. The three EBVs were assumed to be equally important and combined into a single breeding value as EBVL = (EBV1 +EBV2 +EBV3 )/3. Therefore, the EBV for longevity in the current study is an indication of the ability of a sire's daughters to survive the first three lactations. This approach is similar to that used in the Canadian genetic evaluation in Holsteins (Boettcher et al., 1999b). The scale or unit of the breeding values is unknown when using a linear sire model. To present the breeding values on a desired scale, the breeding values were standardized by using the mean and standard deviation of the base group. The base group was defined as proven sires born between the years 1990 and 2000 inclusive. The standardized breeding values were then expressed as relative breeding values by using the mean of 100 and standard deviation of 5, similar to the procedure used by Van der Linde et al. (2007). where nti is the total number of daughters of sire i, nij is the number of daughters of sire i in contemporary group j, nj is the size of contemporary group j, and summation is over all the number of contemporary groups that sire i has daughters. This method is considered standard in dairy cattle genetic evaluation systems. The criteria for official publication of breeding values for proven sires were that sires were required to have at least one daughter with an observation for herd life; and a minimum of 20 daughters in 10 herds with milk production records. A total of 559 sires met the criteria for publication. Genetic trend was obtained by regressing the mean breeding value on year of birth of sires that met the criteria for publication. 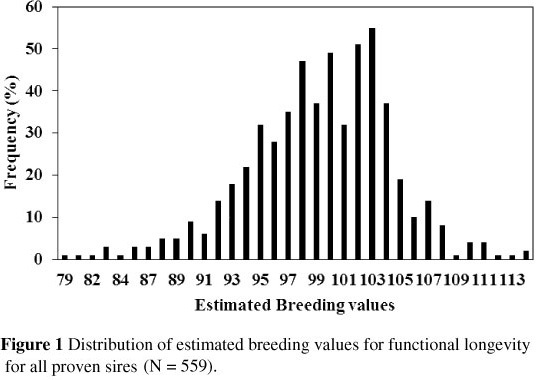 The distribution of the EBVs for the proven sires is shown in Figure 1. The mean and standard deviation of the breeding values of these sires were 99 and 5, respectively. These values were similar to the assumed mean and standard deviation of 100 and 5, respectively. The range of the breeding values was 79 to114. Different expressions of nationally predicted sire breeding values for longevity exist in other countries. Canadian bull proofs on Holsteins for combined herd life are expressed in terms of relative breeding values (RBVs) using a scale with an average of 100 and a range of 85 (undesired) to 115 (desired) to include 99% of all proven sires (Van Doormaal, 2010). Boettcher et al. (1999b) expressed the results of bulls for combined herd life as expected transmitting abilities (ETA) for the number of lactations that daughters are expected to survive, after adjustment for production, standardized to a base of three lactations. The EBV ranged from 2.22 to 3.40 with a standard deviation of 0.15. Using a similar procedure, Jairath et al. (1998) reported a standard deviation of ETA of 0.156 lactations, and the range was from 2.31 to 3.43 lactations. In the national genetic evaluation of Holsteins in the Netherlands, EBVs for functional longevity were expressed as a relative breeding value with a mean of 100 and a genetic standard deviation of 4.5. Owing to trait definition and expression of the breeding value for longevity, the Dutch Cattle Improvement Organisation decided to exclude milk production as an effect from the model of their genetic evaluation from January 2008 onwards. The derived breeding value for productive longevity (true longevity) was expressed in days. The argument for changing from a relative to an absolute expression of the EBV for longevity was that an EBV in days clearly shows the effect of a bull on the longevity of his daughters (Van der Linde et al., 2007). 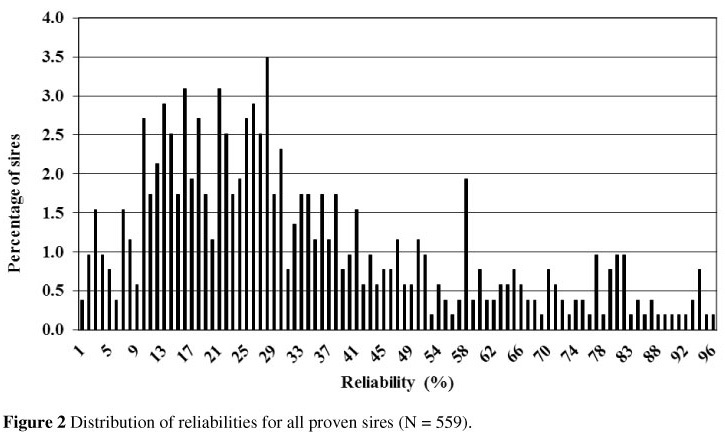 The distribution of reliabilities among the proven sires is somewhat skewed (Figure 2). The mean reliability was 33.43% with a range of 0.82% to 95.66%. These low reliabilities could be owing to an insufficient number of daughters for a more accurate proof because of the low heritability of the trait. The Canadian criterion for an official bull proof is 65% and 55% reliability for production and type traits, respectively. Bull proof for herd life is published only when the criteria for type are met. 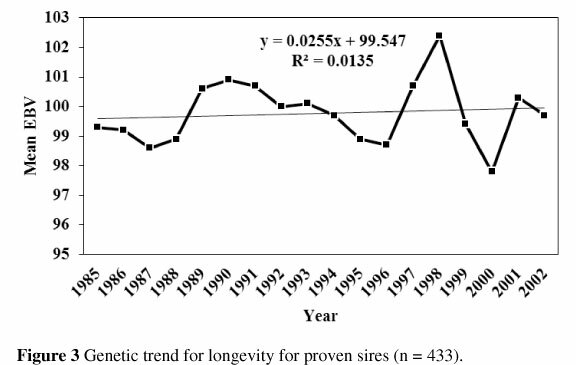 Figure 3 shows the genetic trend for longevity for proven bulls for the period 1985 to 2002. The rate of genetic progress per year was statistically non-significant (b = 0.03 ± 0.05 per year). Similarly, Jairath et al. (1998) reported a slight positive trend for herd life when the means of expected transmitting ability (ETA) were plotted by year of birth. In this study, cows were included in the analyses when they have initiated a first lactation. Survival could only be defined if there was a subsequent calving or the number of days between current calving date and data extraction date exceeded 581, similar to the procedure followed by Boettcher et al. (1999b) and Olori et al. (2002). This delay means that young bulls cannot be evaluated early for longevity, thus ruling out early selection decisions. A further delay is owing to the time it takes to have sufficient daughters for reliable proof because of the low heritability of the trait (Olori et al., 2002). As reported by Boettcher et al. (1999b) on Canadian Holsteins, registered South African Jerseys are classified for conformation during their first lactations, and functional herd life includes the first three lactations. Therefore most bulls, particularly recent progeny test bulls, will have more daughter information for linear-type traits than for functional herd life. Thus the reliability of the proofs could be enhanced by including linear-type traits in the model for evaluation of longevity. Correlated genetic response on longevity from direct selection on production was estimated in the current study. The results indicate that direct selection for production in the South African Jersey breed did not result in undesirable genetic response in longevity. In addition, the results from the current study indicate that direct selection for longevity in the South African Jersey breed is feasible. However, while direct selection for longevity could lead to genetic progress, this genetic response could be relatively slow owing to the low heritability and long generation interval. This study formed part of the first author's doctorate thesis, which benefited from funding from the South African National Research Foundation.